Check here often for information on meetings and community events. 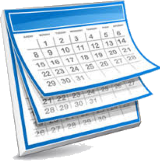 Town Meetings and Holidays Calendar is available here. Community Events Calendar is available here. Parks and Recreation Department Calendar is at their website here.